I absolutely LOVE jewelry which makes a bold fashion statement! My newest jewelry obsession has to be the large chunky rings which stand out in a crowd. I had no idea that Tori Spelling had created an entire collection of bold fashion jewelry for HSN, so naturally I was thrilled when I had the chance to review one of her coolest creations...the Clustered Stone Statement Ring! Keep reading to learn more about how HSN can make your Valentine's Day gift giving an absolute breeze! 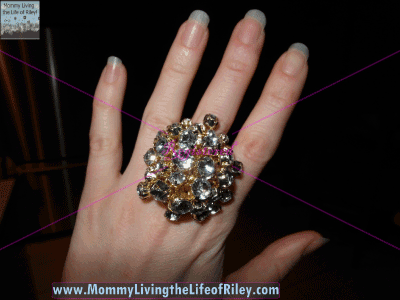 I reviewed the Tori Spelling Clustered Stone Statement Ring from HSN, which retails for $39.95. I was really blown away by the Tori Spelling Clustered Stone Statement Ring from the moment I saw it! Now, this is a ring that will definitely get you noticed. There are actually three versions of this ring: goldtone/clear, goldtone/purple or hematatitetone. I received the goldtone/clear ring, which is definitely my favorite. Three different sizes of sparkly acrylic stones create the large clustered center. What's great is that these stones are free-moving. They don't move a lot, but just enough to draw more attention to the ring. I absolutely love how sparkly and fun this ring is and plan on wearing it quite often (outfit permitting). The only thing that disappointed me slightly was that this ring is goldtone, with no mention as to what the ring's band is actually composed of. I've always had rings which weren't made of either gold or sterling silver, turn my finger green, so I will definitely be wearing this ring for short periods of time at first in order to try it out. I've already worn it during three or four outings and can say that so far, so good...no green finger! 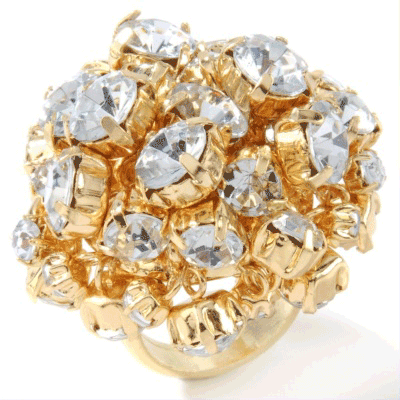 I highly recommend the Clustered Stone Statement Ring from the Tori Spelling Collection at HSN. This ring is extremely beautiful and also very affordable. The goldtone/clear coloring ensures that it will go with virtually everything in your closet and there's no doubt that this ring will turn plenty of heads. If you're looking for a gorgeous piece of jewelry, then check out the other pieces of the Tori Spelling collection too. Personally, I found quite a few that I thought were amazing! Disclosure: I received the Tori Spelling Clustered Stone Statement Ring from HSN in order to facilitate my review. No other compensation was received. This product review is based on my own personal experiences with this item and is completely honest and objective. Wow that ring is huge! Hmmm, I don’t know about all that! I don’t know what to say, lol!